Fortunately for the children, their Aunty Janice is the hero of the story, and even though she is a bit screwed up too because she has a divorced a man she’s still in love with, it is she who provides a circuit-breaker when the maelstrom finally erupts. The novel is too witty to be didactic, but Jordan has some serious points to make about making relationships work and about children as hapless victims of parental self-absorption. Mercedes and Paris are more observant and canny than the adults think, but they are still vulnerable little creatures who want to have both their parents together. What’s consistent in Jordan’s romcoms is plotting to find a satisfying ending for characters who don’t fit the mould. In Addition it was a character with OCD; in Fall Girl it was a professional con-artist; In Our Tiny Useless Hearts Janice is infertile. In amongst the mayhem of the adulterous adults there are sobering glimpses of Caroline’s grief and her regret about the choices she has made, but it’s skilfully handled so that the comedy doesn’t falter. It would probably make an entertaining film! Review copy courtesy of Text. Sorry. I can’t find the place to add one more indigenous writer’s book that I just reviewed; Indian Killer, Sherman Alexie. Native American. Hi Marilyn, thanks for this, it sounds like a very powerful read, and I’ll list it now. (You can add titles any time through comments on the ANZLL Indigenous Reading List page in the top menu, but *smile* it doesn’t really matter where it is). I love Toni Jordan’s work and have read all she has written to date. I must get my mitts on this one. Thanks, Mairi. It’s hectic in a good way: now my father is in aged care here in Melbourne, I’m visiting him a lot while he settles in. I was thinking about ‘farce’ as a description for a book I was reading – probably farce and despair are the only ways to deal with the 21st century. Glad to hear your dod (dear old dad) is down in Melbourne now, though speaking as a dod myself he’s probably hoping visits continue beyond the settling in period. My dom, with sons all round the country, certainly does. Yes, I think you are right, on both counts. Who was it who said that if you don’t laugh, you cry? Loved this book, glad you did too. I read somewhere that Jordan wrote it in the spirit of the old screwball comedy movies – the ones from Cary Grant’s era. I love those old movies…. I watched heaps of them in the 1970s, though mainly musical comedies because I loved the music. I can’t wait to read this one. I only read Jordan for the first time a month ago (Addition) and loved it – fun but well-written; light but not silly; and, as you mentioned a satisfying but not predictable ending. Since reading Addition, Jordan has been popping up on my radar constantly – in the Dear Reader podcast, on the radio and last week, she was on the panel of ABC Book Club that I was in the audience for – not only a talented writer but she seems good fun. I’ve read all her previous books too and enjoyed them. She has a special talent for mixing humour with something a little more intriguing and serious. It’s not easy to do. Indeed yes. Funny, I have approached each one thinking that I might not enjoy it because I tend not to like comic novels, and each time I’ve been delighted to be wrong. haha, Lisa, I’m always a bit nervous about comedy in novels and films, and yet I love a good laugh. Why is this? I think it’s because comedy is so hard to get right? Easy to make people cry but it’s a fine line between cringing and laughing? Oh yes it is … I prefer English and Australian, overall, but there’s good American too. Did you ever listen to/watch Jon Stewart’s political commentary, for example? I just finished this book last night with a good laugh. It was a good fun read. I do like Toni Jordan and her writing. As you say she has good obserbvations skills. I thought it make a great play. Practically all set in one location. I knew I had a good reason to keep this review in my mail box. I really liked the two Jordans I’ve read, so this one goes on the TBR. Can you get it in French, or just in English? What a pity! 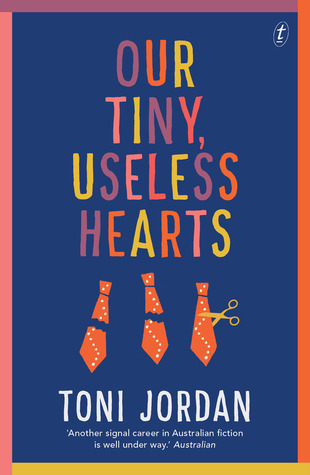 Try clinking the link for ‘buy the eBook’ here https://www.textpublishing.com.au/books/our-tiny-useless-hearts and see if anything works?